Born in South Africa, eighteen-year-old Mari Coetzee’s passion for music was evident at an early age. She began her love for the ’cello at age five with Christine Bootland, performing in many festivals and competitions, and winning numerous awards. Ms. Coetzee is currently in her fourth year of the Advanced Performance Program at Mount Royal University Conservatory where she studies with renowned ’cellists John Kadz and Johanne Perron. 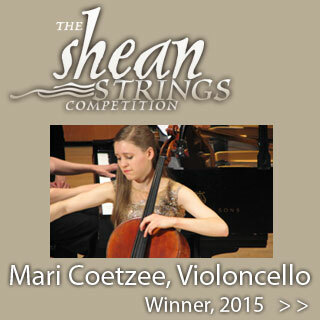 In June 2014, Ms. Coetzee placed first in the Canadian Music Competition’s 17-year-old strings category and also won the Grand Prize for all instruments ages 15-18. She performed with l’Orchestre symphonique de Québec at the CMC Gala Concert. Ms. Coetzee recently graduated from the Royal Conservatory of Music with her ARCT Diploma in ’Cello Performance. She also received a National Gold Medal for the highest mark in Canada for the ARCT exam, for which she received First Class Honours with Distinction. In February 2014, Ms. Coetzee placed first in the Calgary Youth Orchestra’s Frank Simpson Concerto Competition and has had the privilege of performing as soloist with both the CYO and the Medicine Hat Academy Orchestra on five previous occasions. Ms. Coetzee has spent the past four summers attending the prestigious Morningside Music Bridge International Summer Festival and last year also studied at the Orford Arts Centre in the Master Class Program with Laurence Lesser.